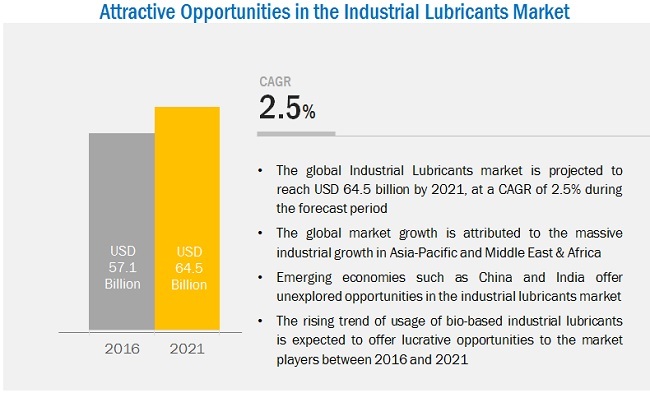 [186 Pages Report] The Global Industrial Lubricants Market was valued at 55.73 billion in 2015, and is projected to reach USD 64.48 billion by 2021, at a CAGR of 2.5% from 2016 to 2021. Industrial lubricants are a mixture of base oils and additives. The additives help to enhance, add, or suppress unwanted properties of the base oil. Industrial lubricants also help to reduce wear and tear of machinery and prevent overheating and corrosion, which in turn increases the efficiency of the machine. Thus, industrial lubricants play a vital role in the smooth functioning of the machinery. In this report, 2015 is considered the base year and the forecast period is from 2016 to 2021. The various end-use industries such as construction & mining, metal production, cement production, automotive, paper, wood, and power generation, are using various heavy load equipment which requires regular lubrication. Owing to increasing competition and growing challenges, the availability of highly updated technology is a vital factor for success in the industries such as automotive, aerospace, and wind. In addition, due to the increasing cost of manpower and safety requirements, there is an increasing need for process automation. The use of automation helps to increase the production rate, reduce labor cost, and improve worker safety & product quality. Consequently, a majority of companies are automating their operating systems which in-turn is driving the consumption of industrial lubricants. The value chain of industrial lubricants include raw material manufacturing companies such as ExxonMobil Corporation (U.S.), Royal Dutch Shell Plc. (Netherlands), BP p.l.c. (U.K.), and others. These companies are vertically integrated, they produce raw material i.e. crude oil and use it for the production of various industrial lubricants. However, companies such as AMS Oil (U.S.), Bell-Ray Company, LLC. (U.S.), are engaged in the production of industrial lubricants using crude oil and additives that are provided by raw material suppliers. After the completion of the production process, industrial lubricants are distributed in the market through different channels. The blending plants supply their products to distributors, which are further distributed among, retailers, independent workshops, and garages. The major end-use industries for industrial lubricants are construction & mining, metal production, cement production, automotive, power generation, marine, food processing, paper, wood, aviation, and others. In august 2016, Fuchs Petrolub acquired industrial oil producer ULTRACHEM INC. (U.S.). ULTRACHEM INC. (U.S.) is a well-known producer and marketer of the specialty synthetic lubricants for the compressor OEMs and industrial maintenance markets. This acquisition has helped the company to enhance its products offerings in the industrial lubricants market. In November 2016, ExxonMobil signed an agreement with Chilean industrial conglomerate Empresas Copec for the production and distribution of lubricants and fuels in Colombia, Ecuador, and Peru. This report categorizes the global market for industrial lubricants on the basis of type, base oil, end-use industry, and region. What are new product lubricants companies are exploring? The global industrial lubricants market was valued at USD 57.09 billion in 2016, and is projected to reach USD 64.48 billion by 2021, at a CAGR of 2.5% from 2016 to 2021. 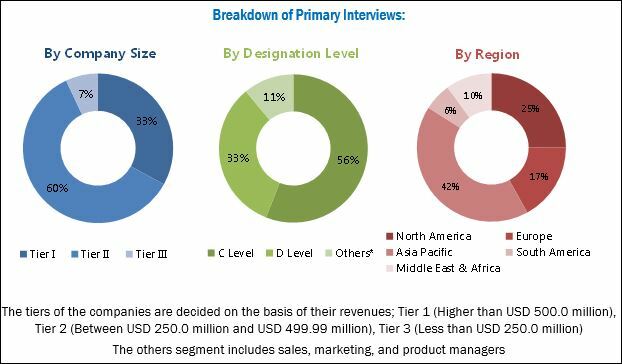 The massive industrial growth in Asia-Pacific and the Middle East & Africa, coupled with the rise in process automation in most of the industries are key factors driving the industrial lubricants market. The primary function of lubricants is to reduce friction between moving surfaces and enhance operations. Industrial lubricants are used in a variety of industrial machines such as hydraulic systems, turbines, compressors, bearings, open & closed gears, machine tool slide way, pneumatic tools, and industrial transmissions. As friction causes heat, lubricants reduce the heat by carrying it away from moving surfaces of machinery and cool its components. Lubricants also prevent rusting and corrosion of moving parts in machinery. On the basis of base oil, the mineral oil is the largest segment of the industrial lubricants market. This is majorly attributed to its easy availability and low cost. However, the synthetic oil expected to register the highest CAGR during the forecast period mainly due to its advance properties. On the basis of regions, Asia-Pacific is the largest as well as fastest-growing market for industrial lubricants. 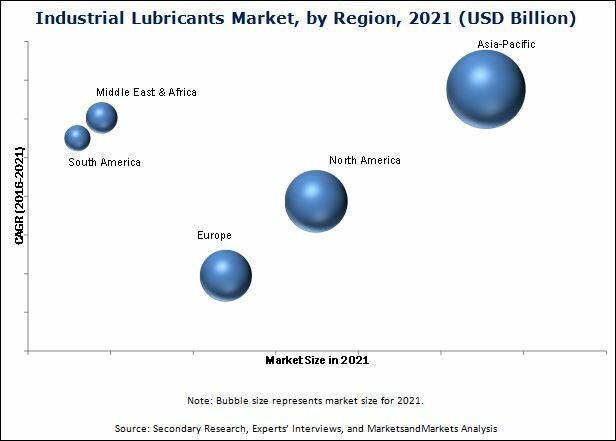 The high growth of the emerging economies and the increasing disposable income in the region make Asia-Pacific an attractive market for industrial lubricant manufacturers. The tremendous growth of industrial production, and increased trade, are primarily responsible for the high consumption of industrial lubricants. A construction site is full of harsh conditions, where the majority of construction equipment is exposed to extreme cold, heat, moisture, and dust, which can affect the performance of equipment. The use of appropriate industrial lubricant on a construction site helps to prevent equipment failure, eliminate downtime and reduces operating cost. There are various heavy loads, mobile, and processing equipment in mining that need industrial lubricants on a large scale. Bucket wheel, excavators, dragline, electric rope shovel, hydraulic shovel, and mining truck uses industrial lubricants such as hydraulic oil, grease, and gear oil. The metal production consumes industrial lubricants on a large scale. The metal production process includes various tasks such as metal cutting, metal grinding, metal forming, and metal joining that operate in extreme environments. The use of industrial lubricants during these processes help to reduce production costs & operating temperature, improve machining quality, and extends the machine life. The cement production plant has some tough operating conditions. The cement manufacturing process involves a variety of heavy duty equipment. The key machines in the cement production plant include crushers, mills, kilns, and coolers. These machines are mainly exposed to the highly abrasive dust, high temperatures, vibrations, and high load. What are the upcoming product type of Industrial lubricants? The high prices of synthetic and bio-based lubricants are restraining their market growth. The synthetic lubricants and bio-based lubricants are expensive as compared to the mineral oil lubricants. Silicone-based synthetic lubricants can cost as high as 20 times the price of mineral oil lubricants. Some of the key players in the global industrial lubricants market are, ExxonMobil Corporation (U.S.), Royal Dutch Shell Plc. (Netherlands), Chevron Corporation (U.S.), BP p.l.c. (U.K.), Total S.A. (France), Petrochina Company Limited (China), Sinopec Limited (China), LUKOIL (Russia), Fuchs Petrolub AG (Germany), Idemitsu Kosan Co. Ltd (Japan), and others. 11.2.1 Royal Dutch Shell PLC. 12.2 Royal Dutch Shell PLC.